How heat is lost in the home? Insulation will reduce the amount of heat lost from your home; by reducing heat/air leakage. Your home is heated by hot air moving from a warm area to a cooler area, if your entire home is not insulated, this heating process will result in heat loss. The type of insulation required for your home will depend on which part of your home is being insulated. Up to 35% of heat is lost through un-insulated walls. There are three types of wall insulation available, different types of insulation are suitable for various types of homes; we would inspect your home and always recommend the most suitable insulation for your home. External Wall Insulation is also known as “The Wrap” is often used to insulate houses that do not have cavity walls. If you are not sure what type of walls are in your home we can inspect your walls when onsite and discuss the insulation options best suited to your home. External Wall Insulation is attached to the outside exterior walls of your home. It is covered in several protective layers and usually finished with a render coat (an alternative Dash option can also be discussed). 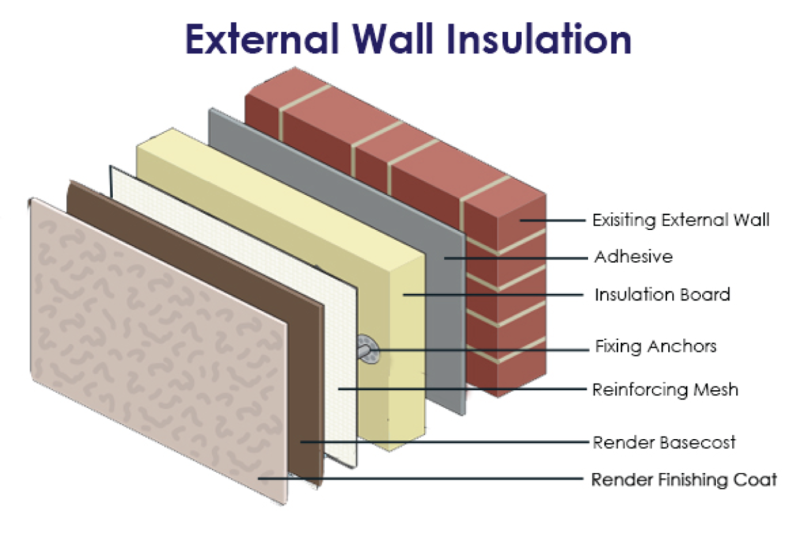 EWI uses rigid polystyrene slabs which are attached to the external walls of your property. Each slab contains thousands of trapped air pockets which creates a barrier that stops heat from escaping through the external walls of your home. The slabs are held in place with fixings, then covered with a layer of reinforcing mesh. Cavity Wall Insulation is installed in the internal cavity of the external walls of your home. This creates a barrier that stops heat from escaping through the walls of your home. This is cheaper to install that the other wall insulation options. Before deciding on CWI, you need to know whether your home has a cavity wall. 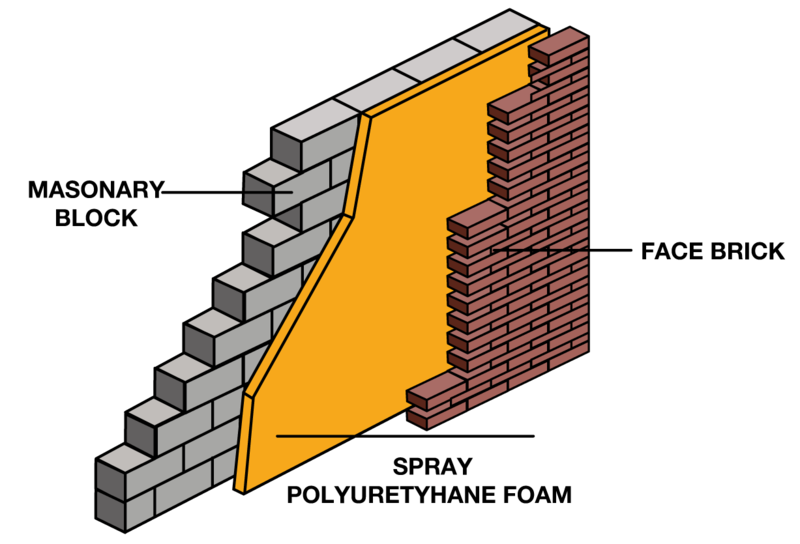 Generally houses built before 1940 – 1950 would have a solid wall. Empty cavity walls would have been introduced in Ireland in the 50s & 60s and became more popular from the 70s onward. We can inspect your walls when onsite and discuss the insulation options best suited to your home. We use Rockwool blown cavity wall insulation in our cavities. This is suitable for use in new and existing buildings. Rockwool Energysaver is quick and clean to install with little or no disruption to the homeowner. Internal Wall Insulation is also known as Internal Dry Lining. This is where insulated plasterboards are fitted to the internal side of the exterior walls of your home. This method of insulation is suitable for all wall types but it is generally used in older homes with solid walls or where Cavity Wall Insulation is not an option. Kingspan Insulating plasterboards (of the agreed thickness) are fitted to the internal walls, a plaster skim is then applied to the wall. We can inspect your walls when onsite and discuss the insulation options best suited to your home. 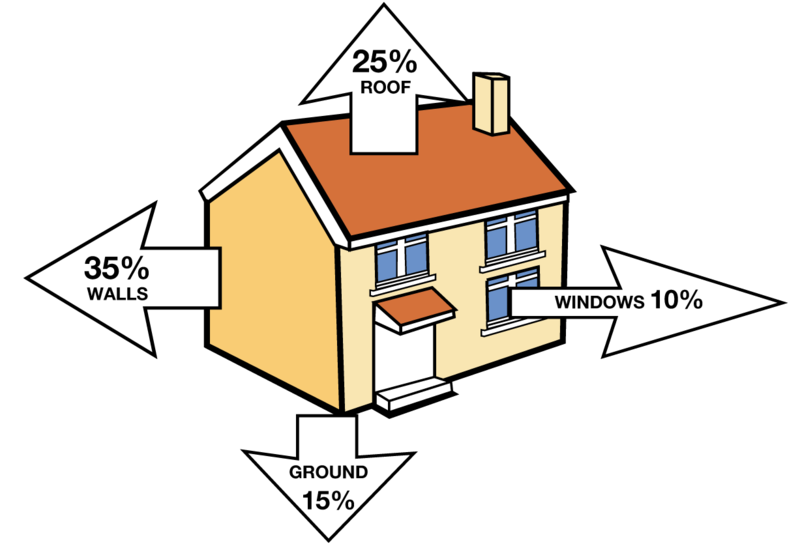 Up to 25% of heat is lost through un-insulated attics. Attic insulation is one of the easiest and most cost effective insulation options to finance and install. 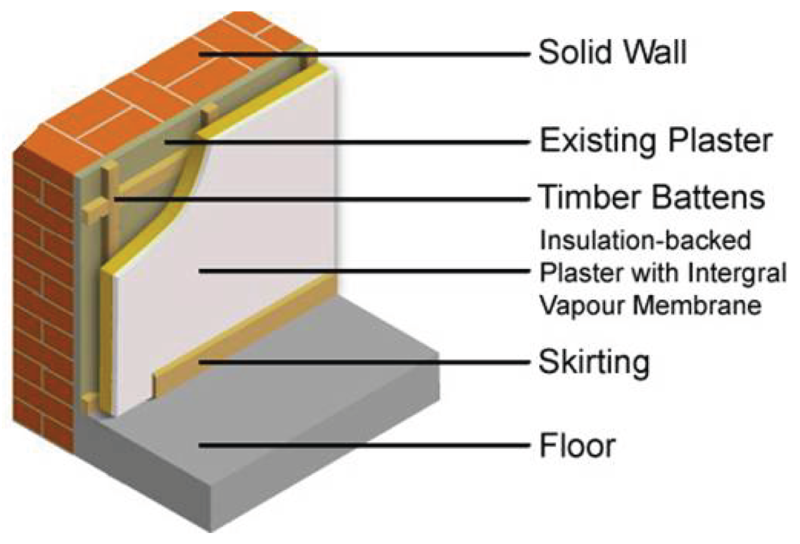 A number of products are available to insulate your attic. Our preferred option is Rockwool RockPrime blown loft insulation which is mechanically installed, this is the fastest possible insulation option for your attic and offers very little disruption to you. 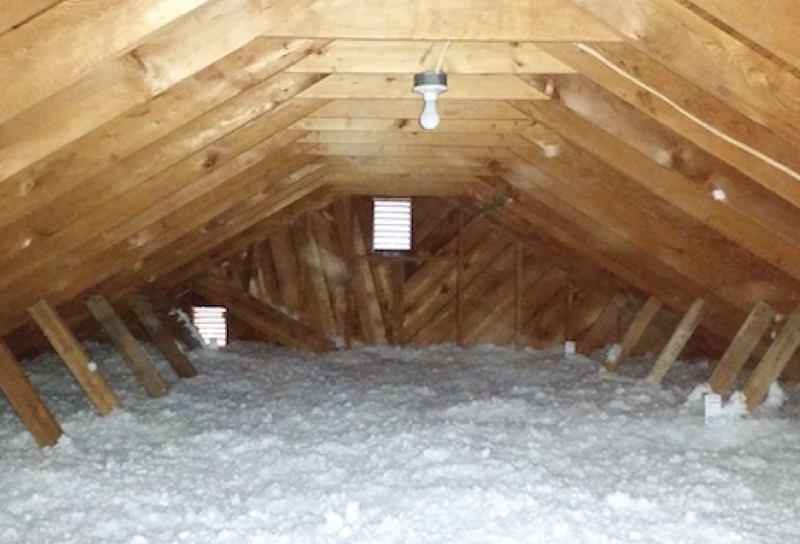 Attic spaces can be filled to a predetermined depth, we can inspect your attic when onsite and discuss the insulation options best suited to your home. Even if you already have insulation installed in the attic, it may be worth inspecting to ensure that enough insulation is in place. Knee walls in Dormer bungalow attic require separate insulation – we can discuss this when onsite to find a suitable insulation option. Our attic insulation service can also provide tank insulation, plumbing insulation, attic hatch insulation and instillation of ventilation as required.